Le Méridien Bora Bora is the perfect blend of French chic and Polynesian charisma. Located on the northern tip of Motu Piti A'au, a small islet that sits along the eastern coral reef, the resort faces the main island of Bora Bora and delivers a gorgeous view of the iconic Mount Otemanu. The overwater bungalows, which make up the majority of guest accommodations at the hotel, feature the largest glass floors of any other resort in French Polynesia. 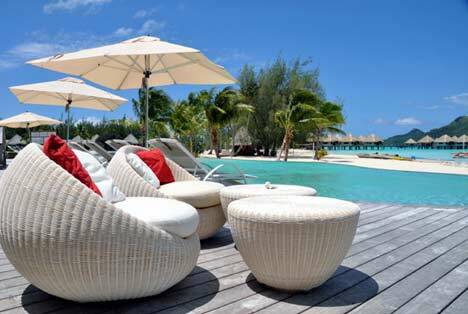 There is also a selection of beach bungalows and private pool villas better suited for families. Home to the famed Turtle Sanctuary, Le Méridien Bora Bora is a true friend to the environment. The hotel features an interior lagoon where it provides protection and care for endangered sea turtles. Nearby is also an interactive touch pool filled with hermit crabs, sea cucumbers, starfish and clams, meaning the kids can enjoy a fun and safe marine biology experience during your stay. Another main attraction at the resort is the Miki Miki Bar; designed to resemble the prow of a ship, it points straight toward Mount Otemanu and provides the ideal place for sunset cocktails. Le Méridien Bora Bora, designed in the contemporary and elegant style, is set on a magnificent islet surrounded by the most beautiful lagoon in the world and offers stunning sights over Mount "Otemanu". This resort offers exclusive accommodations beside a private lagoon on a secluded islet off the southeast coast of Bora Bora. Swimming with sea turtles, feeding sharks and rays, and pirogue-style sailing tours top a long list of aquatic activities. Bungalow-style accommodations include beachside units with hammocks and overwater units with large glass panels in the floor. Overlooking Mt Otemanu, Le Meridien Bora Bora stands on a motu (lagoon island) where holidaymakers from around the globe arrive by boat. Upon arrival, guests walk across the beach, past the swimming pool to the bar and are offered a welcome drink while the front desk staff checks them in. The reception area is part of a series of pavilions in courtyard formation around a large lily pond, and includes shops, a bar, restaurant, lounge, and activities desk. Public areas are decorated with statues, masks, and other artworks from across the Pacific. Bungalows are scattered overwater and through the extensive grounds and coconut groves of the resort. 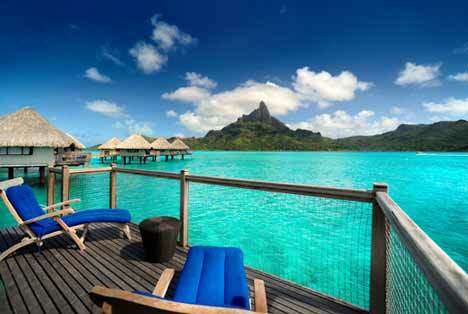 Le Meridien Bora Bora has a swimming pool, beach, and its own inner lagoon, where tropical fish and turtles swim. A wide range of water and other sports are offered, many complimentary. A library and lounge offer flat-screen TV, puzzles, games, books and magazines, and a computer terminal with wireless Internet access (complimentary). A small spa room contains two massage tables, a shower, and a range of massage and health and beauty treatments. The resort also has a wedding chapel located in the coconut grove near the turtle reserve. The inner lagoon at Le Meridien Bora Bora is a sanctuary for hawksbill turtles, and has a program that raises young turtles and eventually releases adults into the wild. The programme operates under the supervision of the Ministry for the Environment. Guests can learn about the turtles, but also have the opportunity to swim among them in their natural habitat, the lagoon. Many colourful tropical fish inhabit the same waters. Le Meridien Bora Bora is located directly across the lagoon from the most dramatic flank of Mt Otemanu. The resort spreads across two islands in the lagoon, and has its own shallow inner lagoon, where tropical fish and turtles swim. A swimming pool is also on site. A library contains a flat-screen TV, puzzles, games, books and magazines, and a computer terminal with wireless Internet access (complimentary). An additional lounge has chess/draughts tables, backgammon, and a seating area with views of the inner lagoon. DVDs in several languages, for in-room viewing, can be borrowed from reception (complimentary). A small spa room contains two massage tables, a shower, and a range of massage and health and beauty treatments. A transit room (complimentary), which comprises a lounge and four bathrooms, can be used for late check-outs. Two shops sell jewellery, black pearls, clothes, gifts, and postcards. The resort also has a wedding chapel located in the coconut grove near the turtle reserve. Le Meridien Bora Bora has a wide range of water sports, many of which are complimentary, as well as other activities such as Tahitian dance and local arts classes. 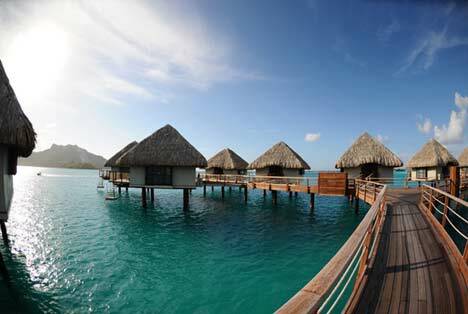 Le Méridien Bora Bora offers six distinct categories of bungalows, all of them entirely renovated in 2010. Discerning guests revel in the authentic Polynesian feel while appreciating modern touches such as a direct-dial phone, safe, Flat Screen Television, minibar, and coffee and tea amenities. Our spacious, air-conditioned bungalows are approximately 60 square meters. While it is not possible to add an extra bed, all include a sofa bed to accommodate a third person. The bathrooms feature a full array of amenities plus a separate bathtub and walk-in shower. Six Beach Bungalows are perfectly integrated around the inner lagoon and provide an exceptionally warm welcome. Each also offers its own private beach, with deck-chairs and hammocks available. These bungalows are available with either a queen-size bed or two single beds. Set on two large pontoons, the Over-water Bungalows have a large section of glass flooring providing fascinating undersea views. Each bungalow features a large private deck, which is an ideal place to read or take in the sunset. Ladders from the deck make it easy to slip into the lagoon’s warm water. 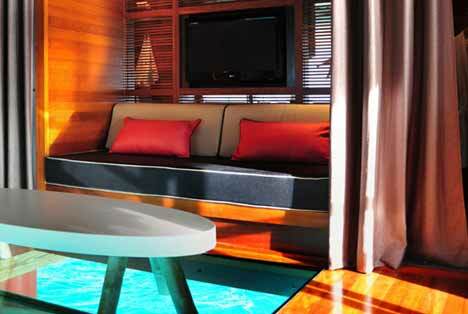 The Premium Over-water Bungalows are ideal for travelers seeking romance and privacy. With Mount Otemanu vistas, these signature bungalows boast the best views in the resort and feature larger decks than Over-water Bungalows. The 50m² (540 sq ft) overwater bungalow features: flat screen TV with video on demand and music channel, telephone, mini bar, air conditioning, Wifi, safety box, tea & coffee facilities, furnished terrace, sofa bed. The Two-Bedroom Pool Beach Villas are ideal for families or groups of friends. These new villas feature two separate bedrooms, and a large living room overlooking a private terrace and infinity pool. Located steps from the turtle sanctuary, these villas are also along the interior lagoon and can accommodate up to eight guests (four adults + four children). For child safety purposes, the pool can be covered. Buffet and à la carte breakfasts and dinners. Polynesian, Asian and Western cuisines, with themed buffets each night. Wine list. Located in open-air pavilions under thatched roofs. Candlelit ambience. Views over inner lagoon. Open daily for breakfast and dinner. À la carte breakfast, lunch, and dinner. Light snacks, pizzas, sandwiches. International cuisine. Poolside location with Mt Otemanu views. Open-air pavilions under thatched roofs, or outdoor location. Open daily from early morning to late evening. Sophisticated bar snacks, cocktails, other alcoholic drinks, and beverages. Relaxed atmosphere. Elevated setting overlooking beach and Mt Otemanu. Cane chairs with white cushions. Evening ukulele player five times per week. Sandwiches, pannini, ice creams, beverages, and other snacks. Breakfast and catering service on request. Small beach hut with bar stools and thatched roof. Open daily from early morning to early evening. Le Meridian Bora Bora features complimentary snorkelling, windsurfing, kayaking, pirogues (flat-bottomed boats), pedal boats, table tennis, badminton, volleyball, Frisbees, footballs, and lawn bowling. Children can make use of buckets and spades, snorkels and masks, and a small sail boat. Scuba diving, jet skiing, parasailing, and waterskiing are also available (surcharges) directly from the resort. A small infinity swimming pool is complemented by a large inner lagoon where guests can swim among fish and turtles. Guests can also enjoy complimentary traditional activities on a regular basis, such as Tahitian dance lessons and local arts and crafts classes. Most activities on Bora Bora are based on organized excursions that can be booked through the Le Meridien Bora Bora. These include trips on the lagoon by submarine or glass-bottom boat; excursions to swim with sharks and sting rays; scuba diving and snorkelling; and sunset cruises, all designed to showcase the magnificent lagoon. Fishing, parasailing, water skiing, and sailing are other lagoon-based options. Jeep and quad safaris, horse riding, and four-wheel driving excursions penetrate the island's mountainous interior. It is also possible to rent bicycles or scooters in Vaitape, the island's main town. (*) Published "from" package price is per person based on double occupancy and includes Economy Class round trip airfare from Los Angeles plus government fees and taxes. Package pricing is based on the lowest published promotional airfares and the lowest available hotel rates at time of publishing. The package price validity dates are indicated on each package page. Different seasonal supplements will apply to travel at different times of the year. Airfares require specific booking code seat availability, which is capacity controlled by the airline concerned, and travel restrictions apply. All airfares and flight schedules are subject to change at any time without prior notice. Fees for checked baggage may apply and vary by airline. For complete information, please visit the airline's Website. Due to currency exchange rate fluctuations, all land prices and taxes are subject to change at any time without prior notice. Package itinerary, availability and terms and conditions are subject to change at any time without prior notice.